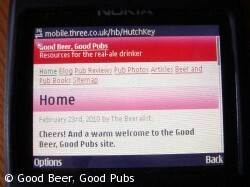 Back in the late spring I blogged about introducing a mobile friendly version of the Good Beer Good Pubs site. This mobile version was provided by using a plugin for WordPress – the content system that drives the site. Recently I’ve been checking the stats and I can see that although the numbers vary, something like 15% of users of this site access it from what the system thinks is a mobile device. The plugin was easy to install and set up, but it can make getting to some parts of the site harder. And the search box is not available – something I can see that many of you use to find your way around. I’d also like to have more flexibility and control over the look and feel. So Coolfields Consulting who set up the site are going to provide a different mobile friendly version that does all the things I want. We’ll start working on this very soon. Previous post: Is it Hophead, or is it Hophead?